Jumaa had been a commander in the Free Syrian Army (FSA), heading up a small rebel group called Liwa Fajr al-Islam. He and his men fought in Qusayr throughout the spring of 2013. When the town fell to Hezbollah fighters and the Syrian regime, he, like many others, headed to Yabroud. Ahmad al-Qusair, a media activist based in the mountainous Qalamoun region, says that Jumaa was known for his manliness and righteousness. In March, Yabroud fell under the control of the Syrian Arab Army. Jumaa, his family and his fighters moved to the outskirts of Arsal, in the no-man’s-land between Lebanon and Syria. The area has been rife with military activity since Yabroud’s takeover. Rebel forces had been fighting Syrian army units, supported by Hezbollah, over individual towns in the Qalamoun region for months. Battles have recently escalated with higher reported death tolls for both sides. Anti-government forces had been using this area, including the Arsal outskirts, to regroup and recuperate between battles. But the arid hills outside of Arsal have also become home for at least tens of thousands of Syrian refugees, many from Homs and the Qalamoun region, who have fled the fighting in Syria. Hundreds of tents are packed close together just beyond the last Lebanese army checkpoint in Wadi Hmeid. Most refugees are afraid of passing through the army post into Arsal and are therefore stranded in the border area. With his family now settled in a makeshift camp, Jumaa was reportedly wary of the area’s clashes spreading to the refugees’ tents. Sources close to him stress that he viewed an attack on the Lebanese army posts around Arsal at the time as an act that would put refugees in danger. Now, however, it seems his alliances have shifted. A few weeks ago, Jumaa pledged allegiance to the Islamic State group’s leader, Abu Bakr al-Baghdadi. Since then, sources say, he has begun dressing fully in black and has grown a considerable beard. More dangerously, Jumaa had begun speaking increasingly of the Lebanese army’s complicity in Hezbollah’s actions in Syria. By letting Hezbollah pass through border points unchallenged, he argued, the Lebanese army would inevitably make itself a target for Syrian rebels in the area. Still, fighters close to Jumaa say his decision to pledge allegiance to the Islamic State was borne out of strategic interest, not an ideological shift. Shortages in supplies and ammunitions have severely affected the fighting capabilities of FSA battalions, including Jumaa’s Liwa Fajr al-Islam. By aligning himself with Baghdadi, Jumaa sought to access the Islamic State’s steady flow of food, weapons, and ammunition, and he has already begun to reap the benefits. Since pledging, his relatively small group of fighters grew from around 40 to over 300. Jumaa is probably the first of many to switch, as several leaders of other FSA battalions in Qalamoun have expressed that their desperation on the battlefield may push them to pledge allegiance to the Islamic State. Jumaa’s arrest has been a game-changer. Besides sparking ongoing clashes in Arsal, where a number of casualties have been reported, his capture has given his supporters the needed justification for specifically targeting the Lebanese security forces. His fighters have allegedly taken a number of hostages, at least two of whom are members of the security forces. In retaliation, the Lebanese army has begun shelling rebel positions in the outskirts of the town with support from Syrian army helicopters. As the violence escalates, Arsal’s community leaders are adamant that this isn’t just about Jumaa. “This is about who controls the border,” Abu Ibrahim, a former LAF member and resident of Arsal, said to us in an interview. Abu Ibrahim had been working to calm the tensions between rebel groups and army units stationed in Arsal, but as clashes continued, it seemed his initiative wasn’t gaining traction. 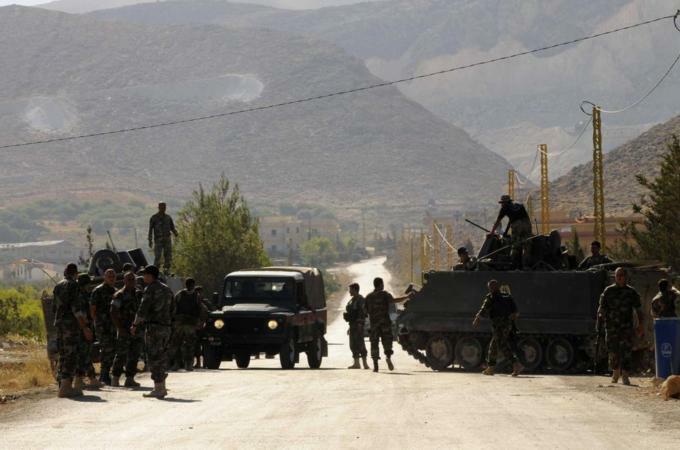 He worried that developments in Arsal would affect other parts of Lebanon, and linked Jumaa’s arrest and the ensuing clashes to the broader battle for the Qalamoun mountains. “Whoever controls Arsal, which makes up 5 percent of Lebanon’s territory, controls the border with Syria,” he concluded.